(c) Premises: The designated space specifically referred to as Suite ___, shown on Exhibit "B" attached hereto and located in the building commonly known as _______________(the "Building") on the property in _______________ more particularly described in Exhibit "A" which is also attached hereto (the "Property"). (d) Rentable Area of the Premises: Approximately ___________ square feet. 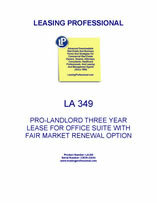 (e) Term: Three (3) years following the Lease Commencement Date. The Lease will terminate on the last day of the thirty-sixth (36th) full calendar month following the Commencement Date. (f) Lease Commencement Date: _________, 200_ (however, Lessee shall have early access to the Premises, at no charge, following Lessor's completion of the Lessee Improvement stated in Section 1.1(m) below). (g) Base Rental: $_________ per month. See Articles 3 and 4. (h) Deposit: $___________. See Article 5. (i) Use: General Office. See Article 6. (j) Parking Privileges: Lessee is authorized to take up to a maximum of ___ parking permits. Lessee must take a minimum of _______ parking permits. See Article 31. (k) Current Monthly Parking Permit Charges: Reserved Permits at $_______/Non-Reserved Permits at $___. (l) Normal Hours: Monday through Friday, from 7:30 a.m. to 6:30 p.m., excepting state and/or federal holidays. (m) Lessee Improvements: Lessor will paint the walls and clean the carpet in the Premises prior to Lessee's occupancy. (n) Broker: Lessor and Lessee each hereby represent and warrant to the other that it has not engaged or dealt with any real estate brokers, salesperson, finders or other persons entitled to any compensation relating to this Lease. (o) Notices: All notices, requests, consents, approvals, payments in connection with this Lease, or communications that either party desires or is required or permitted to give or make to the other party under this Lease, shall only be deemed to have been given, made and delivered, when made or given in writing and personally served, or deposited in the United States mail, certified or registered mail, return receipt requested, postage prepaid to the respective addresses of Lessee or Lessor as set forth below. Lessor or Lessee may from time to time designate other addresses for notice purposes by written notice to the other in accordance herewith. Lessee's Address for Notices Acceptable Tenant, Inc.
Lessee's Address for Billing Purposes: Acceptable Tenant, Inc.
(b) Unless a contrary standard or right is set forth in this Lease, whenever the Lessor or Lessee is granted a right to take action, exercise discretion, or make an allocation, judgment or other determination, Lessor or Lessee shall act reasonably and in good faith and take no action which might result in the frustration of the reasonable expectations of a sophisticated tenant and a sophisticated landlord concerning the benefits to be enjoyed under this Lease. Section 1.3 LEASE OF PREMISES. Lessor leases to Lessee, and Lessee leases from Lessor, the Premises. Section 2.1 EFFECTIVE DATE. This Lease will become effective when signed by Lessor and Lessor's lender on the Property has approved the Lease (if lender's prior approval is required). Section 2.2 COMMENCEMENT DATE. The Term of this Lease and the Rent shall commence on the date that is shown in Section 1.1(f) of this Lease Agreement ("Commencement Date"). In the event the Commencement Date should occur on a date other than that indicated in Section 1.1(f), then Lessor shall send Lessee notice of the occurrence of the Commencement Date in the form of the attached Exhibit "F", which notice Lessee shall acknowledge by executing a copy of the notice and returning it to Lessor. If Lessee fails to sign and return the notice to Lessor within ten (10) days of receipt of the notice from Lessor, the notice as sent by Lessor shall be deemed to have correctly set forth the Commencement Date. Failure of Lessor to send such notice shall have no effect on the Commencement Date. Section 2.3 DELAY IN DELIVERY OF PREMISES. If Lessor is unable to deliver possession of the Premises to Lessee on or before the Commencement Date, Lessor shall not be subject to any liability for its failure to do so. This failure shall not affect the validity of this Lease or the obligations of Lessee under it, but the Lease Term shall commence on the date on which Lessor delivers possession of the Premises to Lessee. The Lease Expiration Date shall be extended for a like period plus any additional period required to make the Lease Expiration Date the last day of the calendar month. Lessor shall use its commercially reasonable efforts to enforce its rights to possession of the Premises against any holdover tenant. If Lessor is unable to deliver possession of the Premises to Lessee by ____________ , 200_, then either party shall have the right to terminate this Lease by providing the other party with written notice thereof within five (5) business days following said Outside Date. Section 3.1 PAYMENT OF BASE RENTAL. Lessee shall pay the Base Rental, in advance, without prior notice, demand or billing statement, on or before the first day of each calendar month during the entire Term. Concurrently with Lessee's execution of this Lease and the submission thereof for Lessor's execution, Lessee shall pay to Lessor the Base Rental payable hereunder for one full calendar month of the Term as set forth in Section 1.1(g). On the Commencement Date, Lessee shall pay to Lessor the prorated Base Rental attributable to the month in which the Commencement Date occurs if the Commencement Date occurs on a date other than the first day of a calendar month. Section 3.2 GOVERNMENTAL ASSESSMENTS. In addition to the Base Rental, Lessee shall pay, prior to delinquency, all personal property taxes, charges, rates, duties and license fees assessed against or levied upon Lessee's occupancy of the Premises, or upon any Lessee Improvements, trade fixtures, furnishings, equipment or other personal property contained in the Premises (collectively, "Personal Property"). Lessee shall cause such assessments upon Personal Property to be billed separately from the property of Lessor. Lessee hereby agrees to indemnify, defend and hold Lessor harmless from and against the payment of all such assessments. Section 3.3 SPECIAL CHARGES FOR SPECIAL SERVICES. Lessee agrees to pay to Lessor, within ten (10) days following written demand, all charges for any services, goods and/or materials, which shall include Lessor's 15% administrative cost surcharge thereon, furnished by Lessor at Lessee's request which are not otherwise required to be furnished by Lessor under this Lease without separate charge or reimbursement. Section 3.4 DEFINITION OF RENT. Any and all payments of Base Rental (including any and all increases thereof) and any and all taxes, fees, charges, costs, expenses, insurance obligations, late charges, interest, and all other payments, disbursements or reimbursements (collectively, "Rent") which are attributable to, payable by or the responsibility of Lessee under this Lease, constitute "rent" within the meaning of applicable law. Any Rent payable to Lessor by Lessee for any fractional month shall be prorated based on a three hundred sixty-five (365) day year. All payments owed by Lessee under this Lease shall be paid to Lessor in lawful money of the United States of America at the Lessor's Address for Payment of Rent set forth in Section 1.1(p) or such other address as Lessor notifies Lessee in writing from time to time. All payments shall be paid without deduction, setoff or counterclaim. Section 3.5 LATE CHARGE. Lessee acknowledges that the late payment of Rent will cause Lessor to incur damages, including administrative costs, loss of use of the overdue funds and other costs, the exact amount of which would be impractical and extremely difficult to ascertain. Lessor and Lessee agree that if Lessor does not receive a payment of Rent within five (5) days after the date that such payment is due, Lessee shall pay to Lessor a late charge equal to ten percent (10%) of the delinquent amount, as liquidated damages for the damages which Lessor is likely to incur for the thirty (30) day period following the due date of such payment. Further, all portions of Rent not paid within thirty (30) days following its due date and all late charges associated therewith shall bear interest at the Interest Rate (as defined below) beginning on the thirty-first (31st) day following the due date of such Rent and continuing until such Rent, late charges and interest are paid in full. Acceptance of the late charge, and/or interest by Lessor shall not cure or waive Lessee's default, nor prevent Lessor from exercising, before or after such acceptance, any and all of the rights and remedies for a default provided by this Lease or at law or in equity. Payment of the late charge and/or interest is not an alternative means of performance of Lessee's obligation to pay Rent at the times specified in this Lease. Lessee will be liable for the late charge regardless of whether Lessee's failure to pay the Rent when due constitutes a default under this Lease. The term "Interest Rate" shall mean the maximum interest rate permitted by law. Section 3.6 ACCELERATION OF BASE RENTAL PAYMENTS. In the event a late charge becomes payable pursuant to Section 3.5 of this Lease for three (3) payments of any one or more elements of Rent within a twelve (12) month period, then all subsequent Rent payments shall immediately and automatically become payable by Lessee quarterly, in advance, instead of monthly. After one (1) year of quarterly rent payments being made in a timely manner, the monthly rent payment date shall be reinstated. Section 3.7 DISPUTES AS TO PAYMENTS OF RENT. Lessee agrees to pay the Rent required under this Lease within the time limits set forth in this Lease. If Lessee receives from Lessor an invoice or statement, which invoice or statement is sent by Lessor in good faith, and Lessee in good faith disputes whether all or any part of such Rent is due and owing, Lessee shall nevertheless pay to Lessor the amount of the Rent indicated on the invoice or statement until Lessee receives a final judgment from a court of competent jurisdiction (or when arbitration is permitted or required, receives a final award from an arbitrator) relieving or mitigating Lessee's obligation to pay such Rent. In such instance where Lessee disputes its obligations to pay all or part of the Rent indicated on such invoice or statement, Lessee shall, concurrently with the payment of such Rent, provide Lessor with a letter or notice entitled "Payment Under Protest," specifying in detail why Lessee is not required to pay all or part of such Rent. Lessee will be deemed to have waived its right to contest any past payment of Rent unless it has filed a lawsuit against Lessor (or when arbitration is permitted or required, filed for arbitration and has served Lessor with notice of such filing), and has served a summons on Lessor, within one (1) year of such payment. Until an Event of Default by Lessee occurs, Lessor shall continue to provide the services and utilities required by this Lease. Section 4.1 OPERATING EXPENSE ADJUSTMENTS. Lessor and Lessee agree that in lieu of calculating the adjustments to Building operating expenses (which are passed through to lessees as additional Rent each year) for each year of the Term, Lessee shall pay to Lessor as additional Rent the sum of ________ per Rentable Square Foot per month beginning on the first anniversary date of the Commencement Date and increasing by ___________ per Rentable Square Foot per month commencing at the beginning of each year of the Term thereafter, including extensions thereof. Such amount shall be added to the amount of Base Rental payable hereunder. Section 5.1 SECURITY DEPOSIT. Concurrently with Lessee's execution of this Lease and submission thereof for Lessor's execution, Lessee shall pay the Deposit to Lessor, which Deposit shall be held by Lessor as security for the full and faithful performance of Lessee's covenants and obligations under the Lease. The Deposit is not an advance Base Rental deposit, an advance payment of any other kind, or a measure of Lessor's damages in case of Lessee's default. If Lessee fails to comply with the full and timely performance of any or all of Lessee's covenants and obligations set forth in this Lease, then Lessor may, from time to time, without waiving any other remedy available to Lessor, use the Deposit, or any portion of it, to the extent necessary to cure or remedy such failure or to compensate Lessor for any or all damages sustained by Lessor resulting from Lessee's failure to comply fully and timely with its obligations pursuant to this Lease. Lessee shall immediately pay to Lessor on demand the amount so applied in order to restore the Deposit to its original amount, and Lessee's failure to immediately do so shall constitute a default under this Lease. If Lessee is in compliance with the covenants and obligations set forth in this Lease at the time which is sixty (60) days following the time of both the expiration (or earlier termination) of this Lease and Lessee's vacating of the Premises, Lessor shall return the Deposit to Lessee promptly thereafter. Lessor's obligations with respect to the Deposit are those of a debtor and not a trustee. Lessor shall not be required to maintain the Deposit separate and apart from Lessor's general or other funds, and Lessor may commingle the Deposit with any of Lessor's general or other funds. Lessee shall not at any time be entitled to interest on the Deposit. Section 6.1 RESTRICTION ON USE. Lessee shall not do or permit to be done in or about the Property, nor bring, keep or permit to be brought or kept therein, anything which is prohibited by the attached Exhibits "C" and "D" or by any standard form fire insurance policy or which will in any way increase the existing rate of, or affect, any fire or other insurance upon the Building or its contents, or which will cause a weight load or stress on the floor or any other portion of the Premises in excess of the weight load or stress which the floor or other portion of the Premises is designed to bear. Lessee, at Lessee's sole cost, shall comply with all laws (as defined in Section 20.2) affecting the Premises, and with the requirements of any Board of Fire Underwriters or other similar body now or hereafter instituted, and shall also comply with any order, directive or certificate of occupancy issued pursuant to any Laws, which affect the condition, use or occupancy of the Premises, including, but not limited to, any requirements of structural changes related to or affected by Lessee's acts, occupancy or use of the Premises. The judgment of any court of competent jurisdiction or the admission of Lessee in any action against Lessee, whether or not Lessor is a party to such action, shall be conclusive as between Lessor and Lessee in establishing such violation. Lessee shall not conduct retail operations from the Premises or use the Premises for medical or dental offices or for any other office purpose which is different from the office operations permitted by Lessor of its other tenants in the Building. Section 6.2 COMPLIANCE BY OTHER LESSEES. Lessor shall not be liable to Lessee for any other occupant's or tenant's failure to conduct itself in accordance with the provisions of this Article 6, and Lessee shall not be released or excused from the performance of any of its obligations under this Lease in the event of any such failure. Section 7.1 ADDITIONS OR IMPROVEMENTS TO THE PREMISES. Lessee shall not have the right to make any alterations additions or improvements to the Premises without the Lessor's express prior written consent. In the event Lessee requests Lessor's consent to make Alterations, such consent shall be, without exception, and at a minimum conditioned on Lessor's standard rules and regulations regarding Alterations. Section 7.2 FIXTURES. All Lessee Improvements upon the Premises and any replacements therefor, including all air-conditioning or heating systems, paneling, decorations, partitions and railings affixed to the realty, except furniture or movable trade fixtures installed at the expense of Lessee, shall become the property of the Lessor and shall remain upon, and be surrendered with, the Premises as a part thereof at the termination of this Lease, without compensation to Lessee; unless, Lessor, by notice given to Lessee prior to the end of the Term, shall elect to have Lessee remove any or all such Lessee Improvements. Thereupon Lessee shall accomplish such removal at its sole cost, repair any damage caused by such removal, and restore the Premises to their former condition.